Some curious things happen when you begin writing about food. First, you start fielding frantic five o’clock queries from the supermarket asking what’s in your chile recipe? or what can I make for dinner with two breasts of chicken and a red bell pepper? Second, the blog becomes a food diary of sorts, forcing you to become aware of questionable food habits. It’s all spelled out for you right there in black and white. It’s sort of like the time in culinary school when I had to record the number of times I went to the gym in a month for my PE requirement. I thought for sure I’d worked out 20 times. It was actually five. I have a similar lack of self-awareness with food. I’ve always thought I was a healthy eater (and, for the record, I still think I am), but MAN do I love mayonnaise! 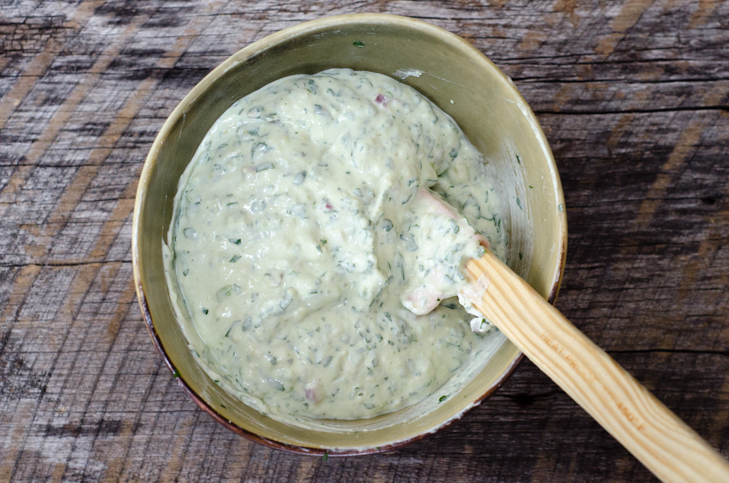 If you’ve been paying attention to the blog, you probably already know this: Blue Cheese Dip, Potato Salad, Buttermilk Dressing for Cobb Salad. The newest addition to the list? this yogurt sauce. 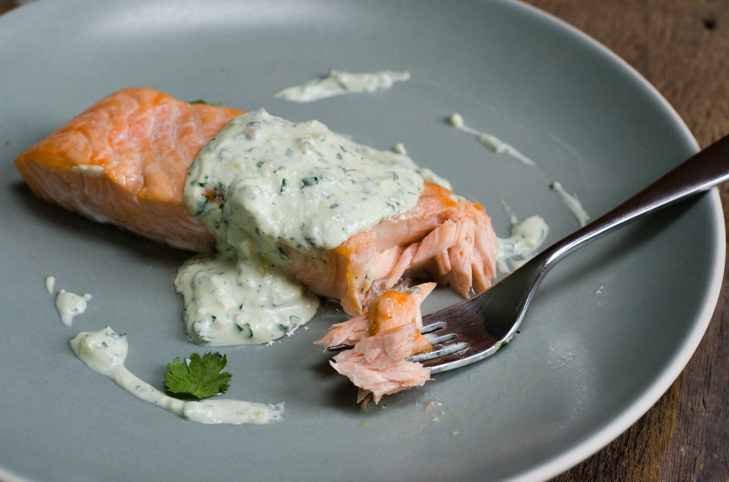 I’ve been making salmon with a dill + yogurt + lemon sauce every spring for as long as I can remember. It contains (you guessed it!) 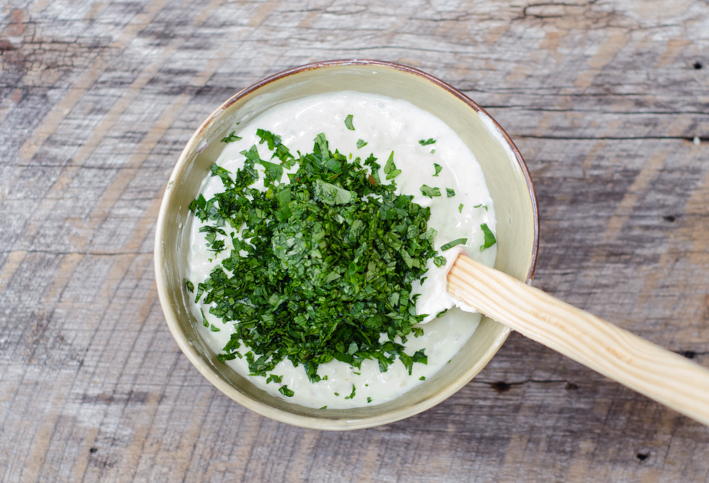 the smallest dab of mayonnaise, plus a ton of dill, yogurt, lemon juice and a restrained amount of raw garlic. 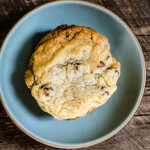 It’s delicious, and everyone loves it but it’s also pretty ubiquitous. I decided to play around with the formula this week, adding avocado to the base, a move inspired by the lovely recipe for Greek Goddess Salmon in Leah Koenig’s approachable new book, Modern Jewish Cooking. Then I kept making changes: To the shallot and garlic base, I added lime juice instead of lemon, soaking the alliums in the citrus to dull their raw *bite. * I combined the yogurt, mayonnaise, avocado, and lime mixture with a bunch of chopped cilantro and parsley, instead of the usual dill. The creamy, tangy yogurt and lime juice are great counterpoints to the rich salmon and the whole thing has a fun southwestern flair. It would be great too, I’m sure, with a little heat – a drizzle of Cholula or chiles in adobo sauce (don’t get me started on these perfect condiments). 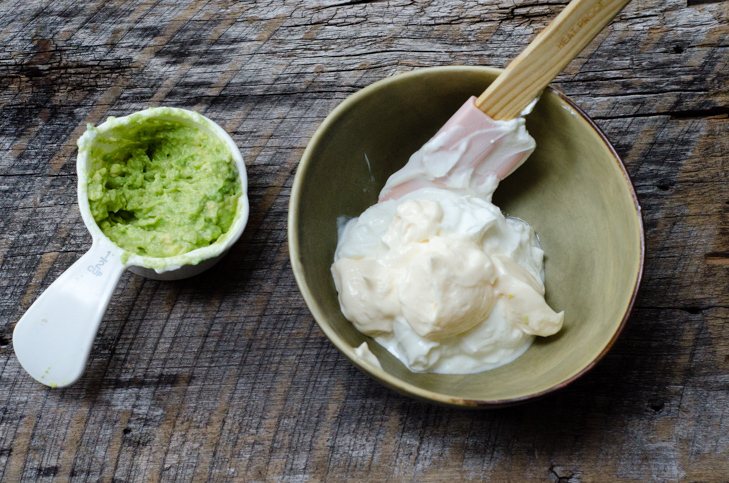 To my credit, there’s very little mayonnaise – just enough to take the edge off of the sour yogurt. Mayo-haters (you know who you are! ), try substituting whole milk plain yogurt for the Greek and leaving out the mayonnaise and the result will be almost as good. Almost. 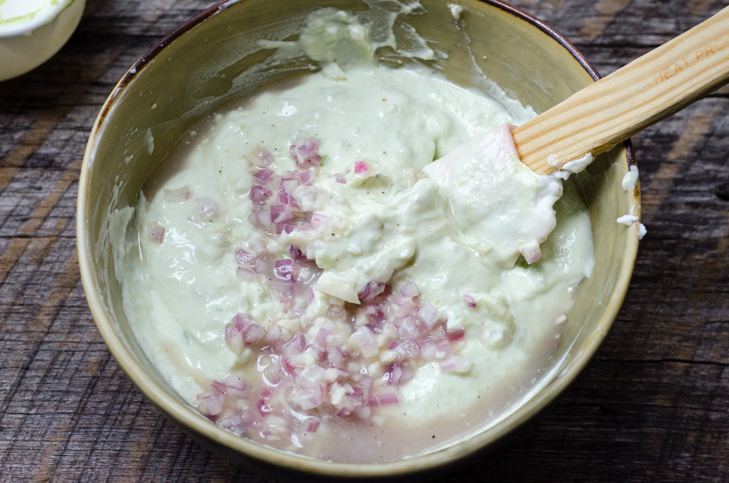 The sauce is an updated green goddess dressing with a twist. It's what happens when you get bored with traditional dill/yogurt/lemon sauce and have a ripe avocado sitting on your counter. I took the best elements of green goddess + yogurt dill sauce and combined them into a creamy, herby, springtime alternative. If the dressing seems a little thick, add a drizzle of cold water, a teaspoon at a time, until it reaches the desired consistency. It should be thick, but just barely pourable. I would have shared this much, much sooner, but I was waiting for it to stop snowing - this dish requires grass on the ground and buds on the trees. 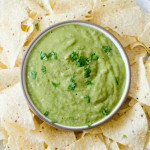 The dressing yields about a cup, which is more than enough for four servings. Serve leftover sauce over salad greens or grilled chicken. Preheat the oven to 450 degrees F and place the top rack about 12 inches from the top of the oven. 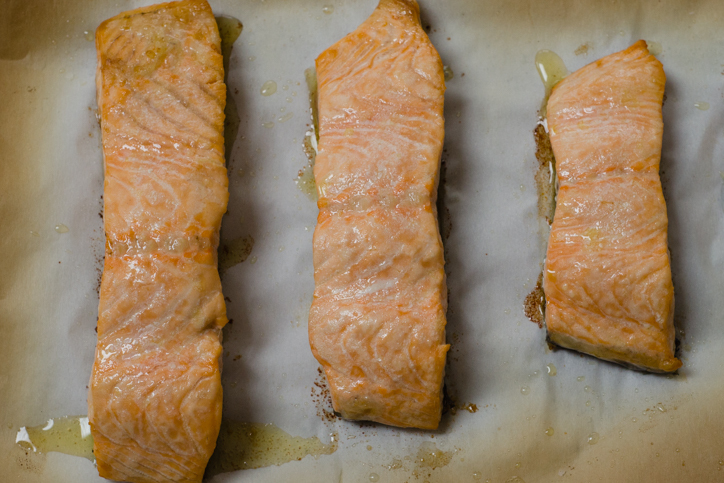 Place the salmon on a sheet tray lined with a piece of parchment. Season lightly with salt and pepper and drizzle each piece generously with olive oil. When the oven is ready, slide the sheet tray on the top rack and roast the salmon for 8 to 12 minutes, depending on thickness of the fish (about 8 minutes for ¾ inch thick, 10 minutes for 1-inch thick, and 12 to 15 minutes for up to 1 ½ inches thick). 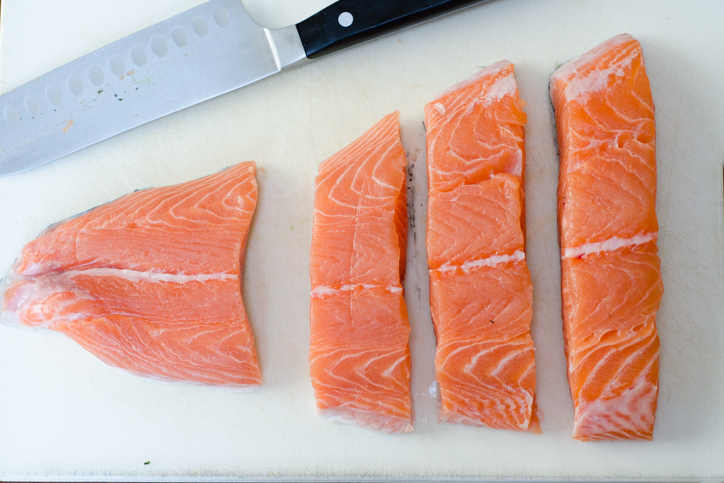 While the salmon roasts, make the sauce: Combine the lime juice, garlic, salt, and pepper in a small bowl. Let sit 5 minutes. 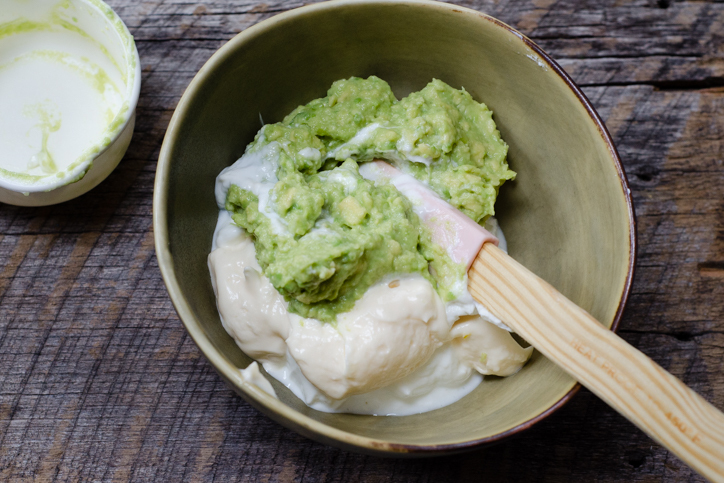 In a medium bowl, combine the yogurt, mayonnaise, avocado, cilantro, and parsley. Stir to combine with a rubber spatula or spoon. Add the lime juice/garlic mixture and stir well to combine. Season to taste with additional salt and pepper. The sauce can be stored, covered, in the refrigerator for up to a day before serving. Add 1 to 2 teaspoons of water to thin out the sauce, if necessary. 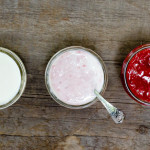 (I find this is needed when using Greek yogurt, but plain regular yogurt is looser and more pourable). 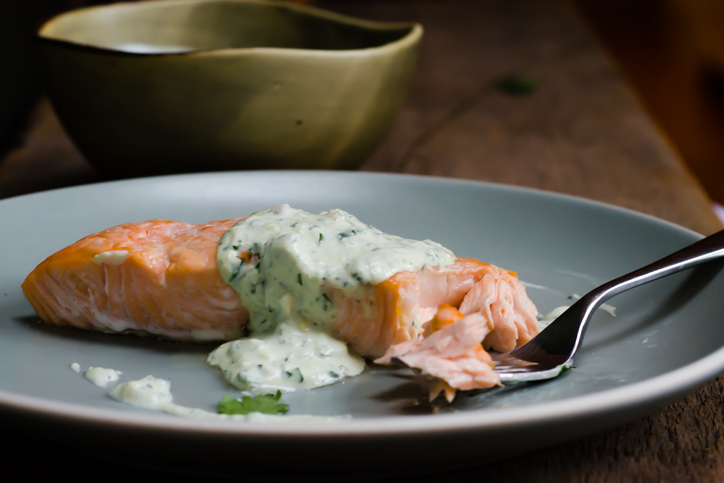 Serve the salmon hot or at room temperature, topped with a dollop of sauce and additional chopped parsley and cilantro if desired. Yum….can’t wait to make this sauce. Sounds so delish, Steph! I can’t wait to make this. The way you make something fabulous with what is hanging out in your refrigerator is genius! I’m making this tomorrow. And I might include both chills in adobo AND Cholula because more spice is always better, right?! I just made this last night…sooo good! Even Leo was excited about it – no small feat! Thank you.